Everyone loves intellect devourers. Who doesn’t enjoy having their brain replaced by an actual brain with legs? 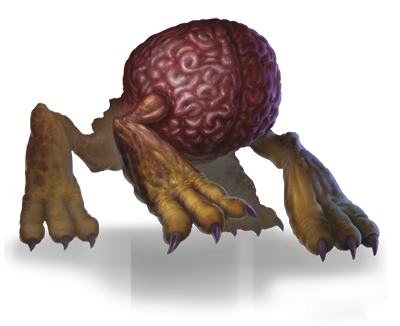 It’s silly yet scary, a quintessential D&D monster. The little critters have always been dangerous, but in the 5th edition of D&D they are absurd. They are so deadly that I wouldn’t recommend ever using them. But that doesn’t mean you can’t have fun with them. All it took is a realization: given how easily a 5e intellect devourer can defeat most people, you won’t ever meet one out in the open. Instead, you’ll encounter people and monsters who’ve once met the critters, and now carry them inside. One could even create a model for just how easily the IDs would spread. There clearly was a need (there wasn’t). So I made one such tool, using a Mandrake equation to estimate the odds an ID had taken over the person you’ve just met. And because I love intellect devourers, here’s a tiny bit of fiction about them, as well as a philosophical musing by a special guest.